Is it possible to UPDATE a CTE? Yes & No, depending on the number of base tables, the CTE is created upon, and the number of base tables affected by the UPDATE statement. If this is not clear at the moment, don't worry. We will try to understand this with an example. 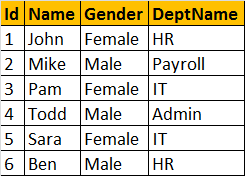 Let's create the required tblEmployee and tblDepartment tables, that we will be using for this demo. Let's create a simple common table expression, based on tblEmployee table. 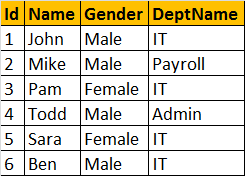 Employees_Name_Gender CTE is getting all the required columns from one base table tblEmployee. Now, query the tblEmployee table. JOHN's gender is actually UPDATED. So, if a CTE is created on one base table, then it is possible to UPDATE the CTE, which in turn will update the underlying base table. In this case, UPDATING Employees_Name_Gender CTE, updates tblEmployee table. Now, let's create a CTE, on both the tables - tblEmployee and tblDepartment. The CTE should return, Employee Id, Name, Gender and Department. In short the output should be as shown below. Let's update this CTE. Let's change JOHN's Gender from Female to Male. Here, the CTE is based on 2 tables, but the UPDATE statement affects only one base table tblEmployee. So the UPDATE succeeds. So, if a CTE is based on more than one table, and if the UPDATE affects only one base table, then the UPDATE is allowed. Now, let's try to UPDATE the CTE, in such a way, that the update affects both the tables - tblEmployee and tblDepartment. This UPDATE statement changes Gender from tblEmployee table and DeptName from tblDepartment table. When you execute this UPDATE, you get an error stating - 'View or function EmployeesByDepartment is not updatable because the modification affects multiple base tables'. So, if a CTE is based on multiple tables, and if the UPDATE statement affects more than 1 base table, then the UPDATE is not allowed. Finally, let's try to UPDATE just the DeptName. Let's change JOHN's DeptName from HR to IT. Before, you execute the UPDATE statement, notice that BEN is also currently in HR department. After you execute the UPDATE. Select data from the CTE, and you will see that BEN's DeptName is also changed to IT. This is because, when we updated the CTE, the UPDATE has actually changed the DeptName from HR to IT, in tblDepartment table, instead of changing the DepartmentId column (from 3 to 1) in tblEmployee table. So, if a CTE is based on multiple tables, and if the UPDATE statement affects only one base table, the update succeeds. But the update may not work as you expect. 1. A CTE is based on a single base table, then the UPDATE suceeds and works as expected. 2. A CTE is based on more than one base table, and if the UPDATE affects multiple base tables, the update is not allowed and the statement terminates with an error.